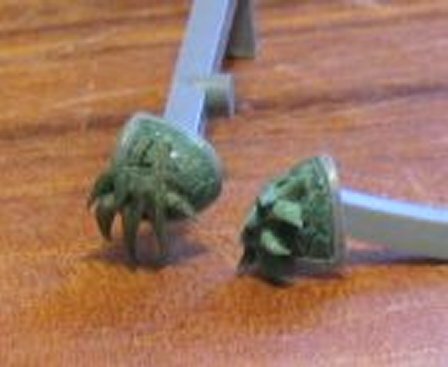 The greenstuff itself can be made to have different properties. If you mix in more yellow you'll get a sticky, hard to work stuff that is perfect for really tiny detail. Another downside is that it will also take several days (not hours) to dry. On the contrary, more blue will provide with an un-sticky and a bit harder stuff that is perfect for bigger areas and details. To battle sticky greenstuff I use a piece of cloth with a drop of oil soaked in it. 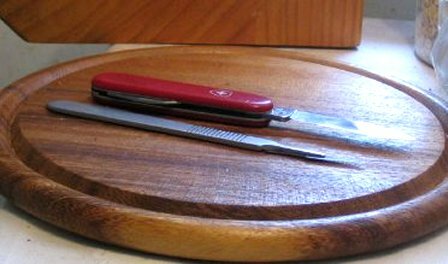 I simply put my fingertip or brush the blade of my knife along the oily cloth and that will then be perfectly free from sticky greenstuff without having to apply drops of water. 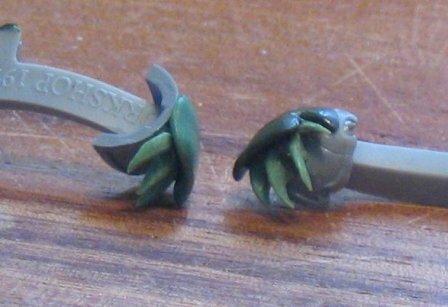 Water is a bad idea since the amount often used will distort the visual of the greenstuff underneath it making it hard to actually sculpt details in it. 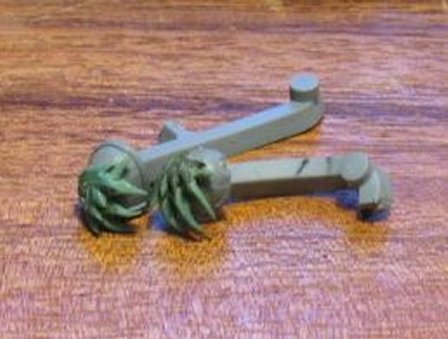 To ensure that no fingerprints are left use the finger nails to flatten out the greenstuff as a finish touch. 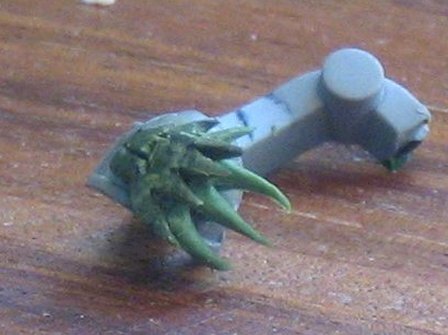 Nails have much less tendency to stick to greenstuff. 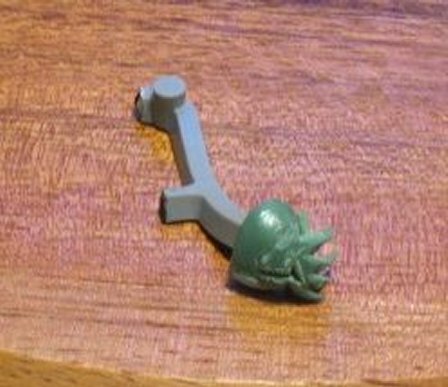 Start with a simple shoulder pad (it doesn't have to be cleaned or free from "fat" at this stage) glued on a piece of plastic sprue to ease the holding and handling of it. 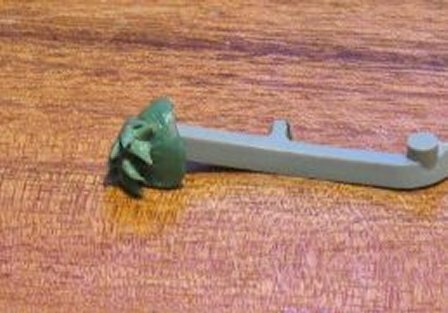 Apply flattened out sphere of greenstuff to it in a way so that it will resemble a basic rough spiky shape with the edge of the flattened out stuff clearly brought out from the pad. This is quite easy accomplished by flattening the sphere of greenstuff with one finger while keeping another fingers nail underneath the edge. When hardened use a knife (scalpel, pocket knife, whatever suites you) and cut a faint shape of the outer spikes like this. 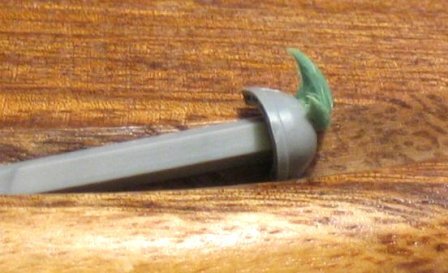 Now cut out the spikes and form them carefully (a sharp scalpel is better at this then a knife) so that they get a more rounded appearance. As a matter of fact form all shapes and edges to give them a rounded shape. 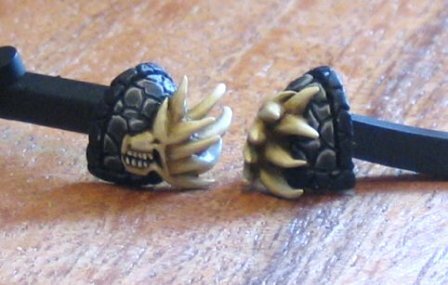 Now as the base is finished the outer spikes will take form. 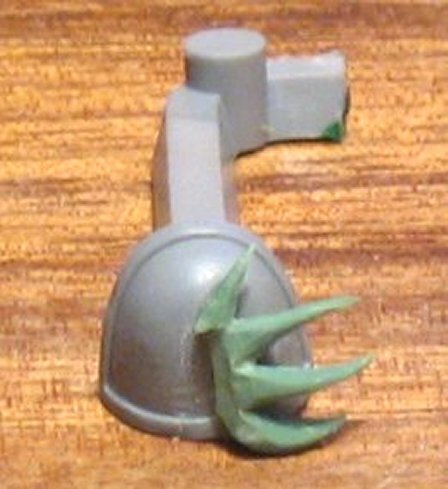 Using a method similar to the base spikes apply a sphere of greenstuff (more blue in this is recommended as it will be stiffer and less prone to interact with the base spikes) and flatten it out using fingers and fingernails to lift the edge so that it floats above the base spikes. 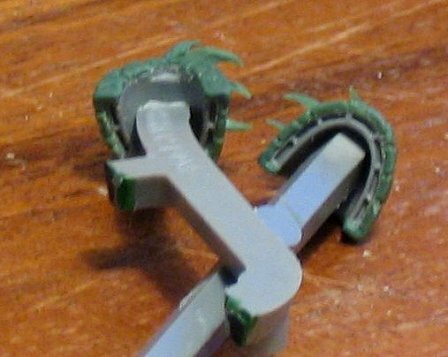 Several attempts to judge the amount of greenstuff used may be necessary to get the right shape/amount of greenstuff in place. 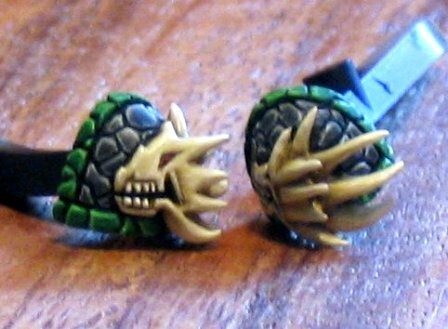 After hardening use a micro pen to mark out the shape of a salamander/drake/dragon head. 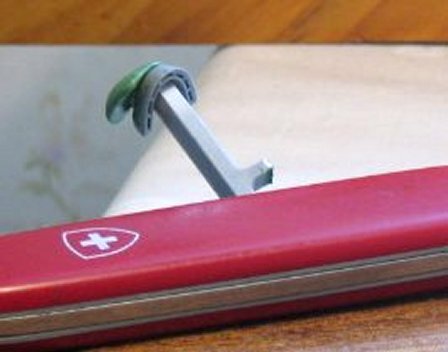 Now use the scalpel to cut out the shape just like previously. Round the shapes and spikes as well to give them a less �sterile� appearance and cut out tiny teeth in the mouth of the drake but wait with the completion of the mouth itself. 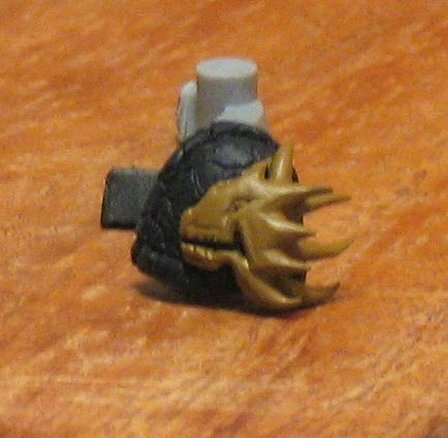 This is also the time to remove the entire head from the shoulder pad as it will probably be covered with ugly cuts all along the soft plastic. 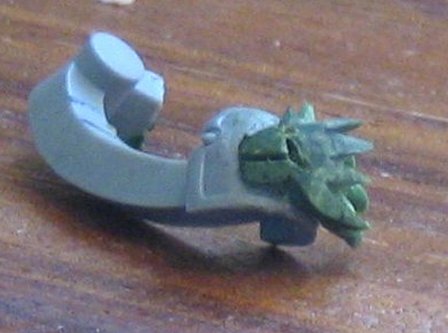 Use a knife to remove the entire piece and this will also give you a perfect opportunity to complete the mouth as it is a difficult detail work and you now have access to the entire sculpt from all sides. 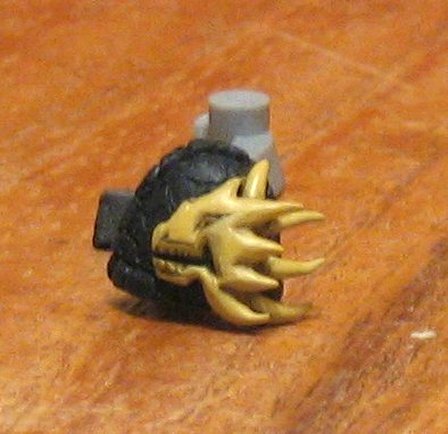 When you are satisfied with the result, use a tiny amount of superglue to place the sculpted head onto a new shoulder pad, plastic or metal. Make sure the new pad is washed and cleaned from fat as you�d really want things to stick to it this time. Use a knife to carefully cut patches around the mouth, eye, end of mouth and nose to give the sculpt more depth. 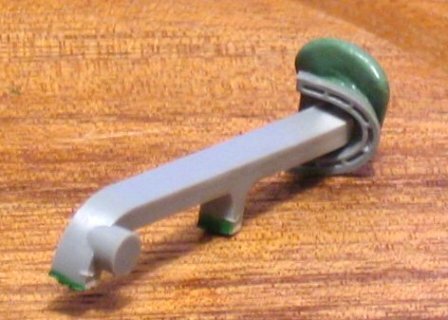 This will also greatly add in your ability to paint the drake head later on. 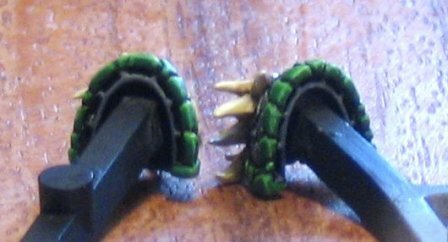 Wait half an hour to make the greenstuff more hardened and less prone to deform and use a tool to press a scaly pattern into the greenstuff (sorry for the poor picture quality). 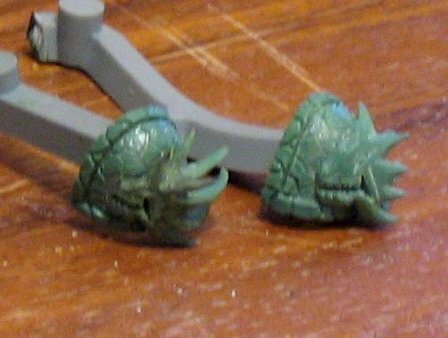 When done make sure there is a narrow space between the greenstuff scales and the rims of the shoulder pad as well as the drake head. 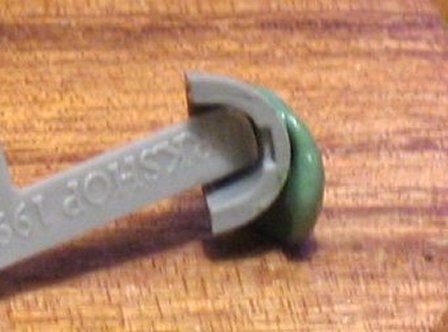 As a tool I use a piece of plastic taken from the sprue and cut a tool out of it. 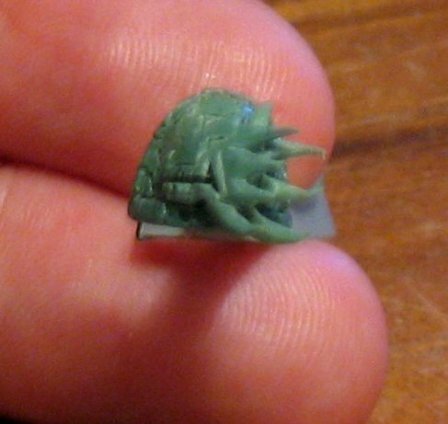 Like a miniature shovel to press scaly patterns into the greenstuff. 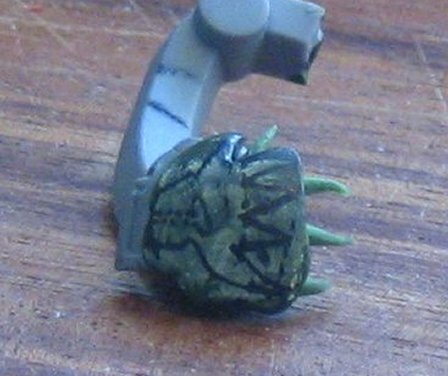 After the scales have hardened roll a thin string of greenstuff (the thickness should be slightly below the thickness of the shoulder pad rim itself). 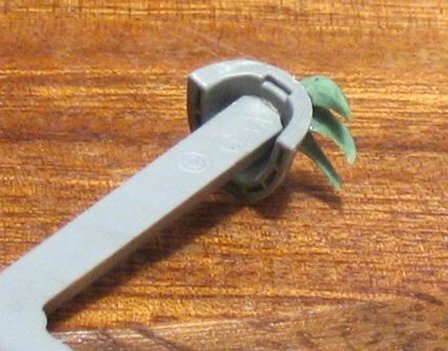 Place the string across/on top of the rim of the pad (not all way around, place it either on the top rim or the side rim as it will enable you to hold and manipulate the pad without destroying the wet greenstuff while sculpting). 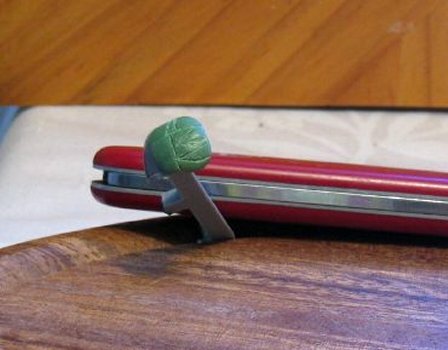 Use the blade of the knife to flatten the string of greenstuff so that it covers the rim and after letting it harden for half an hour use a tool to make scaly marks on the rim. 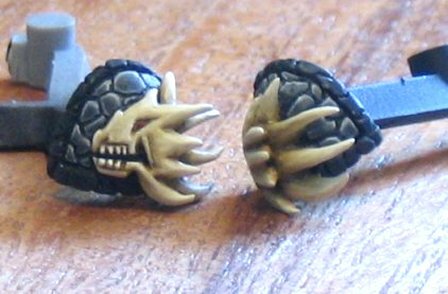 You may also want the rim-scales to co partially around the rim for a nice artificer effect. A black undercoat is used. 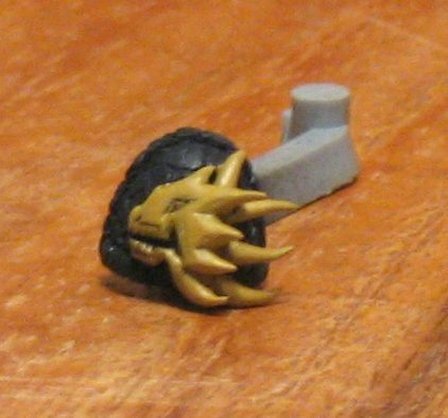 A mixture of scorched brown, graveyard earth and snakebite leather (all GW citadel colours) were used for the head. To this I added tiny amounts of "graveyard earth", "snakebite leather", "bubonic brown" and "bleeched bone". The next layer is painted so that a small amount of the previous layers colour is visible in the edges. I made sure to leave the area of the eyes, mouth and around the teeth dark with the original colour. I added more and more of the colours with the emphasis on bleached bone keeping the layers close to one another as well as close to the previous hue. Seven or eight layers later with more and more bleached bone (and white at the end) added made for the result seen in the picture. The areas around the eyes and mouth were toned carefully to give some added depth to the overall finish. 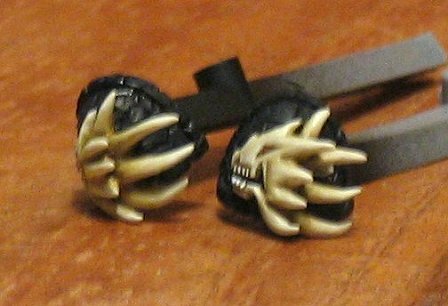 The teeth were carefully painted white as was the eye painted �gore red� and highlighted with blood red in one of the drake heads. 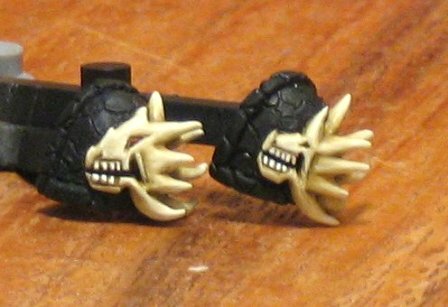 The scales were based with a mixture of black, graveyard earth and white. As the shading towards the upper (from where the light is supposed to fall) edges took progress I used increasing amounts of graveyard earth and white. Use as many layers as you feel is ok in order to give the toning a smooth appearance. I used five layers with the last one having substantial amounts of white in it. 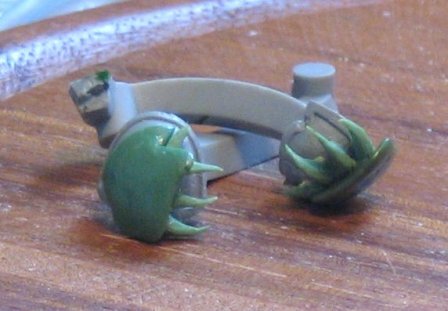 I wanted the rims to be of chapter colour (green) so I used a base of snot green and dark angels green. 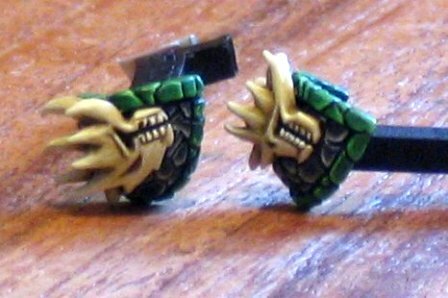 Adding only increasing amounts of scorpion green I worked towards the upper edges of the rim-scales the same way as when painted the black scales. As a final highlight at the very edge of the rim-scales I added some white and yellow.